i. 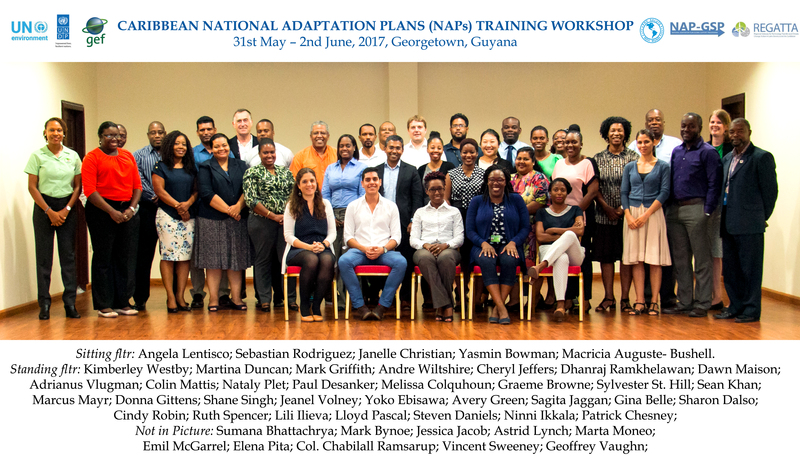 To increase countries capacity to formulate and implement a NAP process in-country, as a means to accelerate adaptation planning and implementation. ii. To take stock of what countries are doing on NAPs and exchange lessons learnt and experiences. iii. To increase understanding on prioritised technical issues around the formulation and implementation of NAPs, including cost-benefit analysis and gender. International and Regional Participating organizations: FAO, PROVIA, WHO, UN-Habitat, CARICOM and CCCCC. In collaboration with: NAP-GSP; REGATTA; CTCN. Session 1 - Introduction to the NAP process - Brief overview of the PNACC process, existing tools and guides available to guide and support countries. Session 2 - Developing NAPs: a stocktake - Policy and Legal frameworks for NAPs, on-going NAP processes in the region. Session 3 - Experiences in the NAP process -Exchange of countries experiences in the NAPs design and implementation and lessons learned. Session 4 - Financing NAPs - Sources of financing for developing and implementing NAPs. Session 5 - NAPs and integrating sectors - Integrating sectors into NAPs. Session 6 - Technical aspects of elaborating NAPs - integrating gender. Session 7 - Technical aspects of elaborating NAPs - Prioritising adaptation options and cost-benefit analysis. Session 9 - NAPs Community of practice - Introduction of the NAPs Community of Practice and prioritization of topics.